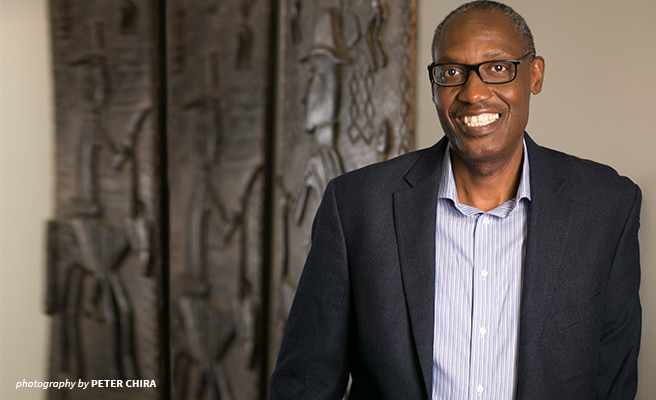 The African Wildlife Foundation is excited to announce the appointment of Mr. Kaddu Kiwe Sebunya as the new Chief Executive Officer effective January 1, 2019. Kaddu, a Ugandan, brings to the table a keen understanding of the continent, its systems and its people. Kaddu started his career at AWF in 2006, working his way up to President in 2015, where he has successfully led AWF’s efforts to advocate for more strategic conservation assistance from the US government in Washington, DC, to implement national and transboundary conservation and development programs in Uganda, and more recently ramped up policy and advocacy efforts resulting in substantial partnerships that have helped advance the African conservation priorities across the continent and globally with development partners. He has helped distinguish AWF as the conservation NGO which puts the needs of the people first. He has spearheaded efforts that have proven that conservation can go hand in hand with development, economic growth and the well-being of communities on the ground. More recently Kaddu has brought that experience to African corporate and political leaders to cultivate conservation leadership at the highest levels across sectors. AWF Board Chair, Ms. Heather Sturt Haaga, said Kaddu’s appointment comes at a crucial time when AWF is developing a new ten-year vision to drive the future growth and success of the organization. “Kaddu’s deep understanding of economic development, conservation, and organizational management comes through many years of relevant professional experience with Conservation International, USAID, the US Peace Corps, and the World Conservation Union (IUCN) to name a few. His experience is broad and varied, and he will bring a wealth of knowledge to the job of CEO at AWF,” said Heather. Kaddu said he is excited to lead AWF. “I am excited to take office at a time when Africa is making important decisions about its future. Africa is defining its own development model, and is taking stock of its rich natural resources – including its spectacular wildlife and wildlands – and how they can be leveraged to benefit people, while also being preserved for future generations to enjoy. Development does not have to come at the cost of conservation, and it is a false choice to insist that Africa can only have one at a time,” said Kaddu. Kaddu looks forward to seeing more Africans take ownership of conservation, particularly young people, whose innovation, passion and ambition will be vital in building an Africa that works for everyone. He is committed to AWF’s continued leadership role in nurturing this conservation leadership. Africa is going through a transitional period that has put immense pressure on its wildlife, it’s wild lands, and the diverse and important landscapes and ecosystems that support all life across the continent. The population is growing exponentially with official statistics predicting that there will be 2.5 billion people living on the continent by 2050. As a result, the need for additional infrastructure, more land for agriculture and human settlement cannot be ignored. AWF is leading the way in reimagining a modern Africa that exploits its developmental and economic potential without compromising its rich biodiversity. “Our work so far shows that this Africa is possible, and has made us a preferred partner for governments and other stakeholders who want to rethink their conservation models and adopt one that does not hurt economic development while also providing the best benefits for people living in wildlife-rich areas,” said Heather.